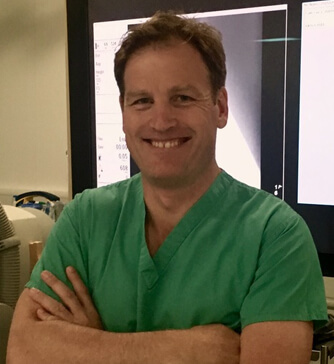 Mr Stephen Black is a Consultant Vascular Surgeon with his main NHS appointment at Guy's and St Thomas' Hospital. Stephen completed his basic medical training in South Africa (University of the Witwatersrand) before immigrating to the United Kingdom in 2001. He went on to complete a MD degree at St Marys Hospital and Imperial College, London in 2006. The subject of his MD thesis was virtual reality based training of surgeons to perform carotid surgery. This was under the supervision of Mr John Wolfe and Lord Ara Darzi. He was first appointed as a consultant in 2010 at St Georges Hospital and subsequently moved to Guys and St Thomas Hospital in 2014. He was awarded the fellowship of the European Board of Vascular Surgery in 2011. His venous practice is well established and he has a particular interest in this field. He is well versed in modern minimally invasive techniques for the treatment of both superficial (varicose) and deep veins. He is the lead for Venous and Lymphoedema surgery at St Thomas’ Hospital. He is on the program committee for the European Venous Forum Hands on Workshops (EVF HOW) and the annual Charing Cross Vascular Symposium. The Charing Cross Symposium is one of the largest vascular meeting in the world. He has lectured widely on the subjects of treatment of acute and chronic DVT. He has an active interest in training and education and is an examiner for the Fellowship of the European Board of Vascular Surgery Exam.